By Jorge Izquierdo and Ramón Recuero. Jorge is a co-founder of Aragon. Ramón Recuero is an entrepreneur and crypto advisor. He previously worked at YC, Zynga, and Moz. We believe that blockchain technologies and cryptocurrencies are, at the core, a new way of organizing and unlocking human potential. Humans have always organized themselves in relatively small sized groups (limited by Dunbar's Number). Hunter-gatherers cultures did so to maximize their quality of life in the form of greater access to food, security in numbers and social connection. Shared myths, like the nation-state, and corporations built on them have allowed us to coordinate greater and greater numbers of people to accomplish more ambitious enterprises like building pyramids, creating computer networks or launching a rocket to the moon1. However, even the most advanced corporations can't escape issues like the principal-agent problem, rent-seeking behavior or conflicts of interest. On this piece, we are going to touch briefly on the origin of companies and then we are going to focus on DAOs. We believe distributed organizations offer a potential solution to these issues as well as a good guiding compass for the future of companies. The origin of modern companies can be traced back to the dutch organization called 'Dutch East India Company'. It was the first company to operate across borders and issue stock in the form of a joint-stock-corporation. At the time, the Netherlands gave companies a monopoly to trade in Asia. The issuance of stock was born to fund this risky commerce route, thousands of kilometers away from Europe. Given that the cost and risk were too high for any one individual to assume, investors were offered a share of future returns, in exchange for their investment. They could share the upside - as well as the downside - without needing to venture away from the comfort of their house. The global risk was spread amongst a pool of many different investors. This created a divide between two actors: Distinguished investors, who didn't want to take on the risk of boarding the ships themselves, from the actual sailors and merchants that journeyed to the far east. Joint-stock corporations were made possible thanks to a technological advancement: the invention of double-entry accounting. Double-entry accounting consists of keeping two types of entries in a ledger: assets and liabilities. Assets and liabilities have to add up to the same value. A greedy manager aiming to defraud the company's investors would have to fake not one but two entries in the book. If he only changes one entry, he would be easily spotted. Ever since the 'Dutch East India' corporation, millions of organizations - descendants of the joint-stock corporation model - have emerged all over the world. These corporations are the backbone of our global economy, with the total value of equities being ~$73 trillion2. A DAO is a new type of organization that, as the initials denote, is decentralized and autonomous. DAOs are decentralized in the sense that, given a set of rules, many different entities can contribute to the organization in a relative permissionless fashion, meaning you don't need to ask for permission to start contributing. DAOs favor inclusiveness and resilience. Individuals and/or organizations under different jurisdictions and motivations can contribute to the organization on a regular basis. These distributed contributors also minimize the risk of failure caused by legal breakdowns or local targeted attacks. Decentralized also means that no single stockholder or founder can single-handedly dictate the fate of the company. The organization can allocate resources by conducting a vote and weighing the voice of its different contributors to maximize the greater good of the organization. The autonomy of a DAO signifies the potential that a few to all organization's operations are carried out automatically, that is, without explicit coordination. Smart contracts running on a public blockchain make DAOs possible in the same way double-entry accounting unlocked joint-stock corporations. By building on top of consensus forming technologies - blockchains -, participants can agree on the state of the organization in the form of assets, liabilities and more. That's not all, participants can also establish a set of rules and its roadmap for the next few months. Then the DAO would choose the best way to allocate its capital. The DAO can, for example, emulate dividend-based stocks and distribute profits amongst contributors or it can focus all its working capital on R&D; or even split it between the two. Greater degree of autonomy could alleviate the principal-agent problem that has plagued corporations since its inception3. At this point, a DAO can be considered an 'unstoppable organization'. It has no central point of failure and has many contributors working for it. It is extremely difficult and not viable to stop this ideal DAO (it would require expensive and difficult coordination at a global scale). A DAO incentivizes humans and machines to work for it. Given their resilience and adaptability to different attack vectors, an ideally designed DAOs is antifragile, where any attack would make the DAO readapt to the current situation and gain resilience. Bitcoin can be considered the world's first DAO. Although the Bitcoin DAO doesn't own any shared resource itself - besides the ledger - it operates in total autonomy and has many distributed actors: miners, users and nodes. It optimizes a very simple function: keeping a consistent order of valid transactions. Bitcoin incentivizes miners to create a block of ordered transactions every ten minutes and tries to maximize the amount of computational work that an attacker would need to do to revert them. The miner that submits the next valid block, receives the right to create a predetermined amount of bitcoins and assign them to whomever they wish (usually themselves). Bitcoin offers these rewards to secure the integrity of the Bitcoin ledger. This simple protocol or DAO has united thousands of people across the world to turn on their computers, servers or even to create optimal chips for this task, in order to compete for this reward. Bitcoin incentivization mechanism has been a great success. One way to measure it is by the hash power its used to secure the network. This hash power directly correlates with energy consumption. Miners spend more electricity to secure the network than the amount consumed by entire developed countries like Denmark4. Let's continue with more recent experiments. Ethereum, a second-generation blockchain created a few years after Bitcoin, mentioned DAOs as one of the main use cases in their original whitepaper. A couple years later, the SlockIt team created the first real DAO on Ethereum. Rather than raising capital through traditional mechanisms, they developed a DAO that would work as a decentralized venture fund. The excitement around the first real DAO was such that during its funding period, The DAO raised 11.5M ETH (more than 10% of all ether in existence at the time). Before its contribution period ended, a group of researchers pleaded for a "Temporary Moratorium on The DAO", pointing out a handful of issues that needed to be fixed before putting proposals out for a vote. Some weeks after this, an anonymous hacker found a vulnerability in The DAO's code that exploited a bug in the mechanism to split the organization to prevent 51% attacks. The DAO funds were slowly drained, putting investor funds at risk. The rest is history, the Ethereum community decided to hard fork - ETC/ETH - in order to rescue the stolen funds. In November 2016, a few months after The DAO failed, Luis and Jorge started working on an unnamed project that would eventually become Aragon. They were living in Silicon Valley and started playing around with the idea of creating companies that existed solely in the blockchain. Their first prototypes featured a decentralized application that would allow managing a startup without no central party. Their objective was to align people towards a common goal; even if they had never met before or trusted one another. Jorge and Luis researched different types of corporate governance structures and realized that land jurisdictions (states) have great amounts of power in deciding which ways people were allowed to organize and which ways they weren't. Different organizations are available in different jurisdictions. Some organizations are restricted under the umbrella of 'protecting retail investors'. These restrictions have limited innovation in ownership and corporate governance models, as they must fit one of the templates provided by the state. Most organizations keep operating - for the most part - under the same hierarchical structures that Ford and other companies pioneered one century ago. The management paradigm of the last century - centered on control and efficiency - no longer suffices in a world where adaptability and creativity drive business success5. We strongly believe that we have not found the optimal organization yet - if there will ever be one - and it would be good to at least experiment with different models. New models that align the incentives of all the participants, participants who have skin in the game. For the last few years, it has been obvious that governance in the world wasn't working as well as the public believed. 2008 was a wake-up call for many. All of our government structures and procedures could not prevent or mitigate once of the worst financial crisis in decades. The current governance structures are around a hundred years old, and while technology has been changing every aspect of our lives, we keep making collective decisions in the same way. We believed that governance could be evolved. To make it happen, we started playing with new types of organizations - malleable and flexible - that can be adapted to any situation with defined rules. After The DAO issue, it became clear to the crypto community that the current infrastructure and engineering processes weren't good enough for creating and deploying complex systems. Security practices and tooling have been slowly improving since the event. Security audits and public bug bounty programs are almost a requirement for any application that manages valuable assets. At Aragon, we have developed different applications to help everyone leverage DAOs. The Aragon client is a decentralized application built on Ethereum that can be used to create and manage DAOs. One of the design goals of the client was to make it generic so it can support different governance mechanisms. 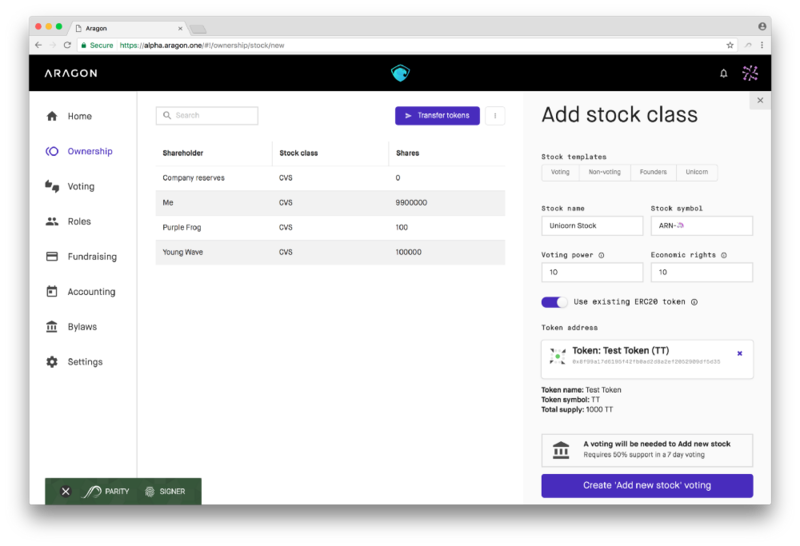 Aragon allows anyone to create complex governance structures, without the need to write any additional or custom software for your organization. The main feature of Aragon is its full upgradeability. Smart contracts are by default static. This means that they cannot be changed once they are deployed. Aragon organizations, on the other hand, can be upgraded. Installing security patches or adding functionality to your DAO is as easy as updating an application on your phone. Upgradeability is a sensitive topic, and it doesn't come without tradeoffs. If a smart contract can be upgraded then whoever does so can change the terms of the contract. That's why Aragon ties upgradeability and governance under a unique smart contract development framework, called aragonOS. aragonOS allows DAO software upgrades to be governed and DAO governance to be upgraded. Token Manager. Manage a token for your org to represent ownership, reputation, voting power and more. Finance. Make and receive payments and maintain accurate bookkeeping for the DAO. Voting. Involves token holders to make collective decisions. By composing these apps in different ways, you can set up both permissions and boundaries between these functions of the DAO and different external actors that interact with it. Potentially, any complex governance structure can be created with these modules. You could even use multiple instances of a given app inside the same organization. For example, one may have two Voting apps, one in which all token holders can vote to elect a board of directors (that receive a token) and another one for the board to cast a vote on a specific issue like choosing to increase the common stock pool. Operations using Aragon DAOs can be extremely efficient, given that a lot of recurring operations and actions can be performed automatically. 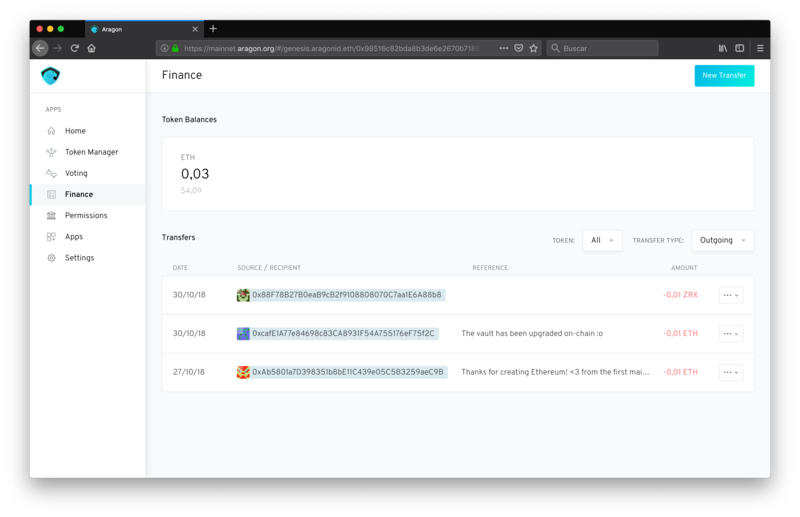 A clear example of this is the Payroll app that will be a part of the Aragon client. There is no manual payroll processing and the transactional costs are really low. With it, employees of an organization can be paid their salary whenever they want to. They just need to ask the smart contract to withdraw the money that they have earned until that point in time. Given that DAOs run on top of public blockchains, they have radical transparency. Every action the DAO performs leaves a trail that can be verified; leaving greedy book-cookers exposed by default. Honesty can be encoded in the DAO itself by making some operations impossible to happen or by enforcing limits automatically. An interesting side effect of organizing using DAOs it that its operations are observable and verifiable. At any given time, the state of a DAO can be inspected. You can check its inner workings and transactions by looking at its smart contracts. On the other hand, this can only be done in traditional organizations by analyzing the huge collection of documents, legal contracts, and amendments compiled over its lifetime - its paper trail. It is hardly surprising, then, that preparing for an IPO can cost several millions of dollars6. Employee options and their vesting schedules are examples of this. In a traditional corporation, these options only exist as signed papers, promising a future right to buy shares at a given price. In a DAO, options can be issued by a smart contract with clear redemption rules - potentially unchangeable - set in code. It is worth noting that uncertainty and ambiguity are difficult to handle by automated systems. Traditional organizations can deal with it as part of the many manual processes they undertake. On DAOs, these decisions that need manual input are best handled with different governance models that receive feedback from the community and then consider their input to decide the best way forward. Let's talk about the different governance models that are being tested and can be instituted as part of future DAOs. The most used governance models have been oligarchy - where a selected group of people rule based on their knowledge, power or nobility- and plutocracy - a subset of oligarchy where the rulers are the wealthiest individuals. Most modern corporations operate using a similar governance model that works in the following way. The organization has two actors: shareholders and managers. Shareholders own the company by purchasing or receiving shares of its stock. Managers direct the company and operate the company on a daily basis. A board of directors is a group of individuals elected to represent both shareholders' interests along with employees and managers of the company. Any major decision must be subjected to a vote and must be approved by the board of directors. This structure works reasonably well up to a point, but tensions inevitably arise from the different interests of managers and shareholders. One of the problems raised in the last few years is the short-termism of public companies. Shareholders demand returns on their investments. Managers, whose compensation is tied to the company quarterly results, focus on optimizing their key indicators, often sacrificing long-term prospects. The lack of alignment between the different parties of an organization is the root of the problem. It is not a surprise that some of the best-performing companies of the last few years have been blamed for ignoring shareholders interests7. It is natural to think that companies whose board is controlled by outsiders would perform better. Paradoxically companies tend to perform better when insiders retain majority of control. We can intuit that the reason lies behind the strong alignment between founders/early employees and the company. They work hard to realize their vision. They know that if the company goes well, they will do great as well. Maybe not next quarter, maybe not even next year, but the score will eventually take care of itself. Apathy - "Why should I bother?" Lack of confidence. - "I don't know enough to make a judgment!" Transparency (especially in nascent democracies) - "Whatever I choose, I won't be able to tell if it was counted correctly." Lack of incentives - "I am not going to spend time on it because I don't get rewarded for good judgment." Ideally, we want a strong alignment between all participants. Having a large number of engaged shareholders can be extremely helpful to maximize the potential of the group. Several governance models have been proposed in the last two decades to achieve this goal. Cryptocurrencies and tokens provide a clear solution to the incentives problem. Every member of the organization has tokens and would be rewarded if the organization performs better. Sam Altman recently proposed an ambitious US Digital Currency following this train of thought. On-chain governance - that is the governance encoded in rules enforced by the blockchain - addresses transparency and observability. On-chain vs off-chain governance is a deeply complex topic8, however, we reiterate our belief that we need to test new models that combine both. Other mechanisms can address the remaining problems. Liquid democracy attempts to address voters' lack of knowledge on a particular issue by letting them delegate their vote on certain topics to experts, combining the best from direct and representative democracy models. Futarchy is usually framed with the following sentence: "Vote on values. Bet on beliefs". Instead of voting on how to solve a specific issue - i.e public school funding - you vote whether or not it is a priority and then prediction markets are used to choose the best solution(s) to tackle the problem. Quadratic voting is another mechanism that is being explored where users can allocate their "voice" across several pressing issues according to how important they are to them. Many crypto projects are already experimenting with governance models. Decred is one project that focuses on governance and balances miners (off-chain) and shareholders (on-chain) interest. Most of them use variations of the plutocratic model where the owners of tokens can vote according to the number of tokens they hold. 8 Is plutocratic on-chain governance really a bad thing? We believe the flexibility and efficiency that DAOs bring will sprout new governance models for corporations and governments alike. We anticipate DAOs that fit diverse purposes, scopes, sizes, and missions. Personal DAOs could be a way for an individual to create an organization that capitalizes on their own potential. This person issues tokens that represent a share of future income and determines the rules for new token issuance. Then, these tokens can then be given to people or institutions that are helping him. Receiving tokens from someone as a result of helping them out, clearly aligns incentives. It could make certain professional areas more appealing and lucrative. Education currently runs mainly on people's altruism compared to having a high-paying job. Given the potential for growth, it is only reasonable that teachers and mentors could be rewarded for their impact. DAOs can also be created to help other DAOs interact together better. An example of this 'higher level' DAO could be the Aragon Network, which is a digital jurisdiction whose mission is to provide some services. One of these services is an arbitration court that DAOs will be able to rely on in case there are some disputes while interacting with other DAOs or individuals. These organizations could be created with the mission to maximize a macro goal, such as the growth of the DAO economy, which could be achieved by correctly architecting the incentives. Anonymous - or pseudonymous - DAOs are also possible. Trustless and faceless organizations can be spawned without even requiring to raise capital to fund its operations. Creating a DAO to perform a token airdrop - free token giveaway - can be a way to kickstart a decentralized project or enterprise without human involvement. At some point, we expect DAOs to own and/or rent physical assets. At that moment, part of our cities' infrastructure could be run by DAOs. For example, a DAO can run a fleet of autonomous vehicles, in what could be an autonomous Uber. The DAO could reward engineers who provide better routing, matching, and fleet optimization algorithms to operate at the maximum efficiency level possible. DAOs can also help bridge the gap between markets and firms. In The Nature of The Firm, Jim Coase poses the following question. Why do we need firms if markets are so good at allocating resources? The short answer is that although markets at extremely effective at coordinating resources around a price, there are transaction costs that make companies more suited for certain economic activities. Cryptonetworks - and DAOs in particular - can provide a middle ground that reduces transaction inefficiencies and still allows for decentralized collaboration. All these use cases help us imagine a not so distant future where DAOs help maximize human wealth. Collaboration between entities that don't even trust each other - only the DAO code - is also possible. Ironically, this new way of operating would increase trust between parties given the impossibility to be malicious or take advantage of the other. Wealth is created through trade and many trade opportunities are locked behind distrust. It's time to unlock these opportunities. More posts by Ramon Recuero.